Some places are like myths; some names sound like music. Paris! The historical centre for art and culture. Glorified as a city of love and joie de vivre– and for me a synonym for the emergence into modernity. My daughter Xira and I went to the city, to paint, and to visit my friend Gaby. “Oh là, là,” Gaby greeted us gaily at her apartment door; “Did you actually make it to Paris?” – “Gabriela Rosa da Silva – photographer, yoga teacher, biodanza, sound massage,” I pointed to her bell sign, “that sounds like a lot of jobs.” – “And a nanny, a wellness trainer, a language teacher,” added Gaby, laughing. “As a an art photographer, you have to be an all-rounder to survive here. Paris has just become terribly expensive.” She showed us her empire of 17 meters squared, an apartment ‘en miniature’ and yet hardly affordable. “But I get to live in Montmartre, my favourite quarter,” explained Gaby. During a long walk, we got to know some of her favourite corners, Gaby’s favourite cafés and shops. Finally, we sat down on the staircases of the lofty Sacré-Cœur cathedral. From here, the city empties into the distance. Streets with splendid houses and buildings merge with suburbs, residential blocks and industrial areas into a huge surface of concrete and stone. Gaby, with a gallant gesture, said, “Voilà, this is modern Paris, big, pulsating, a city full of contradictions and problems, hard and stressful but also exciting and lovable like no other place in the world. What do you actually want to paint tomorrow? The city is bursting with beautiful motifs.” – “The Eiffel Tower, of course,” Xira said. 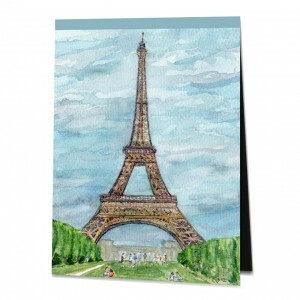 I added: “It is like Paris, grey and gigantic, yet airy and elegant, who does not love it? To experience him closely with the brush, I have been looking forward to it for ages.” Gaby was silent, and smiled thoughtfully. But our declaration of love for her city pleased her.